“Jacqueline Wilson” playing cards were illustrated by Nick Sharratt and published by Winning Moves UK Ltd in 2007. Dame Jacqueline Wilson is a best-selling author whose books for children have sold over 35 million copies in the UK and have been translated into 34 different languages. Her best known work may be the Story of Tracy Beaker about a young girl living in a children’s home and her dreams of being fostered, and who is depicted in these playing cards along with other characters from her large output of books. 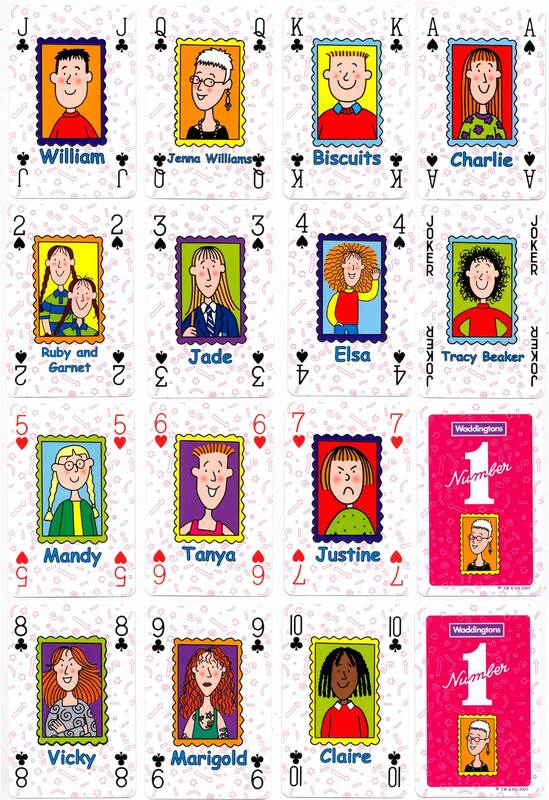 Above: Waddingtons Number 1 “Jacqueline Wilson” playing cards published by Winning Moves UK Ltd, © Jacqueline Wilson & Nick Sharratt, 2007. The backs of the cards feature the portrait of Jacqueline Wilson. Images courtesy Matt Probert.